Clutter usually accumulates discreetly in an office so by the time you notice, it’s already too late and the job of tidying up becomes too overwhelming to handle on your own. A messy office full of clutter is a source of distraction which makes it difficult for your staff to concentrate on important tasks. You need to plan how much time and the frequency which you will dedicate to clearing out the junk in your office. This will depend on factors like the size of your office space, how much stuff is in there, and how much clutter has already accumulated. It could even be during lunch breaks. We tend to keep things hoping to use them someday, yet that day never comes. Throw away what needs to be trashed. You may have a category for returning items to whom they belong. Needless to say, a recycling bin, trash can, and shredder is crucial. Remove all the things that you do not need on your desk. A computer, notepad, a couple of pens or pencils, phone and one or two items are the ideal way to go minimalist. Remove all the non-paper items from your desk, shelves, and other office storage. Sort into different categories. Remove duplicates and things that do not belong to your office. See if there are any papers that you can get rid of in your files. Shred them. In fact, you may choose to go paperless, and have all your documents in soft copy. In going paperless, you need to unsubscribe from websites or magazines that you do not need. You do not need to print every bit of information you receive in your email. You can read your bills online too, and only print important files like tax statements that may need to be kept in paper form. But again, only for a particular period of time. Keeping cables organized is a big challenge. You can creatively take care of cables via simple items like roof gutters. You can buy cable management items too. If you are not able to hide them, then get a creative way to keep them neat. You may need to make a trip to Office Works, but a little creativity here goes a long way. You can for instance use open top baskets on shelves. Ensure that they are well labeled. Make sure that you give everything a permanent home. If after decluttering you still have too much stuff to fit on your desk, it could mean you need to enlarge your work space. Alternatively, opt to get extra storage. You can, for instance, raise your monitor and use the space under the desk. You can also add more shelves. If you do not like traditional shelves, you can go for hidden storage, for instance, behind your computer’s monitor, or use magnets to mount things. There are also other items that you can use to hide routers, cables, and other devices. Your workspace should be comfortable. Your chair should be adjustable and have proper support. Good lighting and a footrest are also good ways to make your office more comfortable. Go for a soft, glare-free light. This way, you decrease strain on your eyes. If you have a light source on your desk, referred to as task lighting, let it supplement your office’s lighting. The lamp should be easily and conveniently positioned over the desk. Moreover, it should gleam on the paper that you are using, not your computer. As soon as the documents come, you need to handle it. If you don’t need to file it, shred it. If you are not able to do it daily, get a file with a few categories. This will make it easier to organize them later on. How long should you keep the papers? Empty your file weekly. At the end of your working day, clear your desk. Be ready to work the following day. As you declutter, you will undoubtedly realize that your shelves, storage areas, and drawers have piled up a lot of dust. This is an opportunity to think about hiring a professional commercial cleaning company to manage the office cleaning duties. Clutter is an increasing problem in Sydney office spaces, identifying it can be difficult as your mind will trick you into believing that you need all those items. 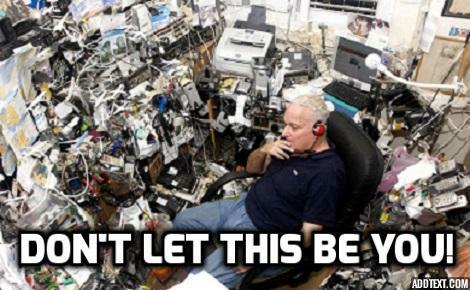 The best way to find out if you have a cluttered office is to take a photo. You will be surprised how clutter will jump out at you. As you have already realized, clutter will decrease your productivity, stress you out in addition to wasting time and money spent on items that you cannot find. If you haven’t cleared out your work space in a while, begin the process by investing just 15 minutes everyday to removing items you don’t need. Most importantly, clear your desk every day before you leave which will also allow office cleaners to do a better job when cleaning it.